To realise that we need people with vision in a new field. I’m looking for a better label but for now I will call it “enhanced town planning” (ETP). The problem is there are no ETP practitioners, no ETP Academics and no degrees or certificates in ETP. Most alarmingly, there is no ETP vision. The aim of this new field is to design lifestyles that are still pleasant but don’t screw up the world. It needs input from engineers, economists, climate scientists, agronomists, house builders, architects, town planners & all of us. Most of all it needs people with ideas and vision who can understand the evidence of our current awful situation. Britain could pioneer an Institute of Enhanced Town Planning: Where should it be? Who should be the first director? And most important of all who will fund it? I look forward to answers. If I get anything sensible they will be added to this piece, also any sensible additional questions. Here are my answers. Other suggestions welcome. A town that is cheap to live in. Ideally with an old fashioned art school. Who should be its first director? 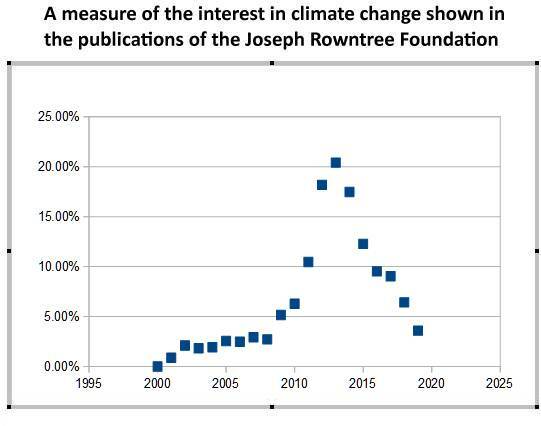 The Joseph Rowntree Foundation would a good starter-for-ten, if they were to take climate change seriously.